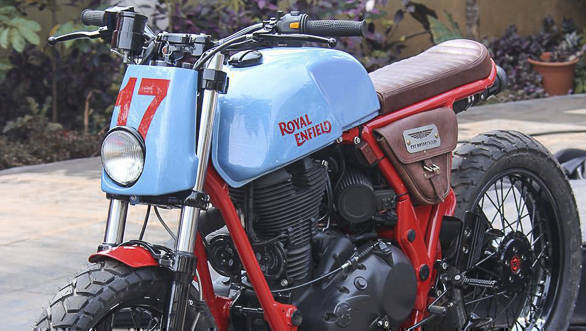 If you have attended any of the Royal Enfield Rider Mania chapters, you must have witnessed a slew of custom creations by various motorcycle builders. The custom motorcycle scene has been gaining immense popularity of late as these unique creation help bring a personal touch to the otherwise regular design. 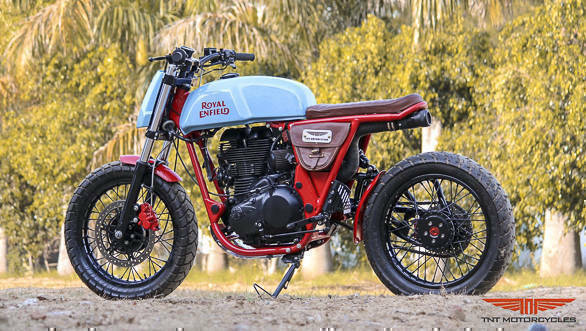 Royal Enfield recently teamed up with four vivid custom motorcycle builders in India to promote their new merchandise, apparel and accessories. We got in touch with Naveen Nandal from TNT Motorcycles to understand his idea behind the Custom Continental GT, one of the four custom motorcycles commissioned by Royal Enfield. TNT Motorcycles is a custom motorcycle brand that was found in 2013. TNT, that stands for Tools and Tattoos, operates out of its base in Delhi. Coming to this RE project, Naveen from TNT states that RE wanted a custom motorcycle that suited the new collection of gears that the company was planning to roll out at the Rider Mania 2016. The Chennai based motorcycle manufacturer gave these builders 45 days to come up with a unique creation based on the Continental GT. RE had clearly stated that the fuel tank and the chassis were to be left untouched. However, they had asked the designers to come up with their own ideas. Naveen's team were not too convinced with the way the Continental GT looked and therefore suggested a change in the seat, handlebar and also the front of the motorcycle. From the images it can be seen, the front fascia is different as it has been fabricated. The headlight assembly that has been imported from Taiwan. The fuel tank sports a distinct matte sky blue shade. Additionally, the rear portion of the frame has been shorted to give it a very butch look. Another aspect that looks really impressive in terms of design is the single side swingarm. Naveen states that it has been developed from scratch with the help of 2.5mm thick pipes made of mild steel. The entire swing arm was designed in house at the company's workshop in Delhi. Naveen explained that the idea was to give the bike a roadster look and for that they wanted the monoshock to be positioned on one side of the motorcycle. This led to the idea of developing a single swingarm. He added, though it was making the design more complicated and in return more challenging, the final design would have looked cooler with the exposed rear chunky tyre. 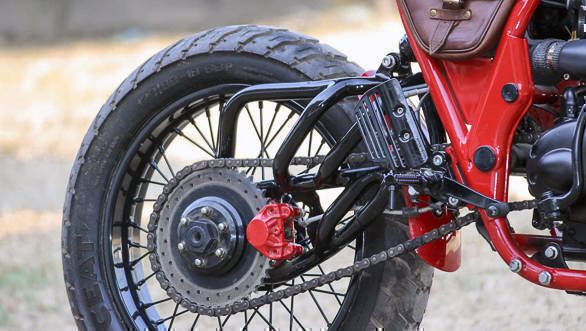 Additionally, the rear hub too has been fabricated out of aluminium by TNT Motorcycles. The Custom Continental GT rides on 120 section and 130 section front and rear Ceat tyres. Apart from the aesthetic changes, Naveen states that the fuel injection of the motor was changed to the carburettor to make it more vintage. 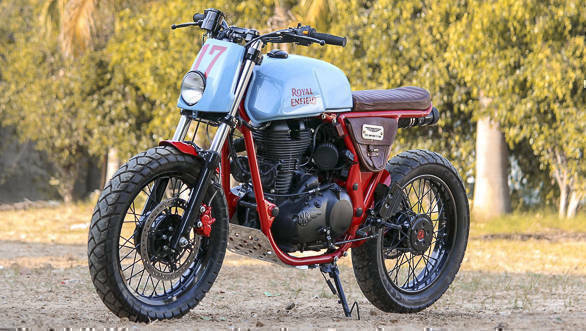 So if you have a Royal Enfield Continental GT and want to make it look like this, how much will it cost? 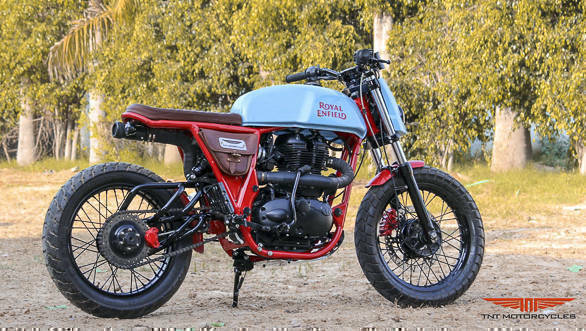 TNT Motorcycles can make this custom Continental GT for Rs 2.8 lakh. Check out their different creations here.